We’d love your help. 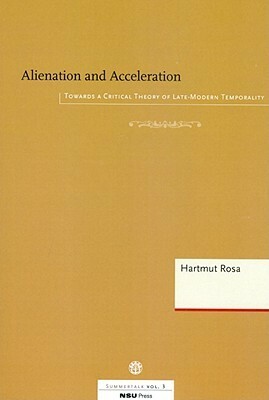 Let us know what’s wrong with this preview of Alienation and Acceleration by Hartmut Rosa. To ask other readers questions about Alienation and Acceleration, please sign up. This short book packs a punch. Hartmut Rosa sees the phenomenon of acceleration as distinctive for late modernity. It is a condition that is totalitarian as it affects everyone and as it is largely immune to critique. Indeed, temporal norms are always perceived as 'out there' and seem to manifest themselves as laws of nature. But Rosa holds that the pathologies and sense of alienation that come with acceleration demand a serious public debate. This book is a summa that relies on fifteen years of This short book packs a punch. Hartmut Rosa sees the phenomenon of acceleration as distinctive for late modernity. It is a condition that is totalitarian as it affects everyone and as it is largely immune to critique. Indeed, temporal norms are always perceived as 'out there' and seem to manifest themselves as laws of nature. But Rosa holds that the pathologies and sense of alienation that come with acceleration demand a serious public debate. This book is a summa that relies on fifteen years of research. In a rather dry but not unpleasant professorial style Rosa explains what the process of societal acceleration is and what drives it. He also illuminates the flip side of the coin - deceleration - and argues why in our times it remains anecdotal, or when it manifests itself at deep structural levels as a lack of adaptability, it is in fact an unavoidable result of the process of speeding up. Rosa proceeds with a two-pronged critique on acceleration. This is the meatiest part of the book. A functionalist analysis zooms in on the internal contradictions of accelerating modernity. These take the form of 'de-synchronisations', between nature and economy, politics and economy, and even within the economic sphere itself. For instance, our democratic form of governance is inherently time-consuming as it requires a patient search for consensus. And this process of collaborative decision-making is slowed down even further when it is confronted with increasing societal diversity and contextual complexity. So, clearly the processes of societal acceleration and effective democratic governance are at loggerheads with each other. Rosa's normative critique starts from the observation that there existed an implicit alignment between the great sweep of modernisation and the process of individual emancipation. But it is increasingly becoming clear that acceleration is eroding personal autonomy. And this experience is triggering a progressive sense of alienation. Rosa shows how layered this phenomenology of alienation is as it affects our relationship with fundamental categories of time, space, extension and agency. Acceleration and alienation was originally published in 2010. For this 2016 Dutch edition, Hartmut Rosa wrote a substantial postscript that contours his more recent research. One line of thinking centres on the thesis that modern societies are only able to dynamically stabilise themselves. In other words, they need to continue to grow and accelerate to maintain their structure and integrity. Another focal point is his theory of 'resonance' as a counterweight to acceleration-induced alienation. Resonance is a mode of being that rests on a dynamic 'question-and-answer' relation between an individual and the world with potentially transformative effects. Family, work and aesthetic experiences are strong spheres of resonance in our culture. How these (and other) spheres can be revitalised is the subject of Hartmut Rosa's recent, monumental Resonanz - Eine Soziologie der Weltbeziehung. In questo libro l'autore, sociologo e scienziato politico, cerca di indagare la natura dell'accelerazione della vita tardomoderna. Perché le nostre vite sono costantemente più frenetiche? Perché l'impressione è quella di avere meno tempo a disposizione? La teoria critica, sostiene Rosa, deve rispondere a queste domande e deve ricercare i motivi per i quali vi sono patologie sociali diffuse, come il senso di minorità e la depressione. Non deve, pertanto, schiacciarsi sulla critica economica o sul In questo libro l'autore, sociologo e scienziato politico, cerca di indagare la natura dell'accelerazione della vita tardomoderna. Perché le nostre vite sono costantemente più frenetiche? Perché l'impressione è quella di avere meno tempo a disposizione? La teoria critica, sostiene Rosa, deve rispondere a queste domande e deve ricercare i motivi per i quali vi sono patologie sociali diffuse, come il senso di minorità e la depressione. Non deve, pertanto, schiacciarsi sulla critica economica o sulla costituzione di nuove ideologie da brandire: si deve occupare delle persone, delle loro sofferenze. In questo orizzonte d'intenti, dunque, Rosa analizza la nozione di tempo, da un punto di vista strettamente sociologico e mai filosofico. L'accelerazione sociale è un dato di fatto, e la penuria di tempo conseguente non fa che amplificare il senso e la necessità di accelerazione. Una nuova forma di totalitarismo, si spinge a dire Rosa, perché esercita una certa pressione sugli individui, non possiamo sfuggirgli ed è una forza onnipervasiva. I punti di partenza, teorici, di Rosa sono variegati: da Adorno a Weber, da Horkheimer ad Habermas ed Honnet. Il tutto è però mitigato da un tentativo di costituire una teoria critica che non sia unicamente critica del capitalismo, piuttosto l'intenzione di Rosa è quello di mostrare le alienazioni provocate dal diffuso fenomeno dell'accelerazione. Ciò vuole evidenziare quali sono i motivi, "ex negativo", per cui, per lo più, non si riesce a realizzare una vita buona. Tali alienazioni - come quella, maggiore, rispetto al tempo, alla sua mancanza - sono impedimenti sulla strada di una equilibrata vita buona. Nogal academisch, en niet mooi afgerond, wegens compilatie/bewerking van meerdere Duitse teksten. Maar voor wie geïnteresseerd is in het thema tijd (en het gebrek daaraan) veruit te verkiezen boven het boek van Safranski, waar 'tijd' een kapstok is voor beschouwingen over allerlei filosofische onderwerpen. 3. Levenstempo: meer doen in minder tijd. Maatschappelijke drijfveer achter versnelling: concurrentie. Culturele drijfveer: versnelling levenstempo is het moderne antwoord op eindigheid van het leven. Versnelling door technologie, maar technologie vergroot ook de mogelijkheden voor afleiding. 4. Intentionele verlangzaming: (a) functionele: retraite, yoga; (b) ideologische oppositionele verlangzaming: religieus, ecologisch, politiek conservatief, anarchistisch. 5. Keerzijde maatsch versnelling: structurele en culturele verstarring. Vervreemding = toestand waarin we datgene wat we doen, niet werkelijk willen doen, ook al handelen we uit vrije wil. 2. Van dingen: dingen worden niet meer gerepareerd, of juist steeds duurder, en consumptie gaat sneller dan slijtage. 4. Ten opzichte van tijd: subjectieve tijdsparadox = beleefde en herinnerde tijd zijn omgekeerd evenredig, dwz intens beleefde tijd voelt kort en laat lange herinnering achter en v.v. Moderne tijdsbeving is kort-kort: korte beleving en korte herinnering (tv kijken). Belevenis = episodisch, geen betekenis; ervaring = vormen, raken of veranderen ons. Tegenwoordig veel belevenissen, weinig ervaringen. 5. Zelfvervreemding en maatschappelijke vervreemding: kortstondige zakelijke contacten. We delen ons levensverhaal niet meer met anderen. Uitgeputte zelf: mens met neiging tot depressies en burn-outs. Onze identiteit wordt gevormd door waar we om geven en waar we ons druk om maken; de onzekerheid daarover bedreigt ons begrip van ons zelf, vervreemding van ons zelf. Vervreemding is een relatie waarin subject en de wereld tegenover elkaar staan zonder innerlijk verbonden te zijn. Resonantie = tegengestelde van vervreemding. Te vinden in natuur, kunst, religie en omgang met specifieke zaken (arbeid, cult). Relatie tussen subject en de wereld die 'antwoordend' is, niet-instrumenteel, over en weer bereiken van elkaar, potentieel transformerend. Strijd on resonantie heeft geen zin; die vernietigt het. Resonantierelaties gaan gepaard met een zekere onbeschikbaarheid; kunnen niet worden afgedwongen, onvoorspelbaar. Resonantie: een lichaam kan pas resoneren als het voldoende afgesloten is, tegelijk voldoende open om zich te laten prikkelen, bereikbaar zijn en zich in trilling laten brengen (vgl klankkast viool). Resonantie is geen harmonie, geen samenvallen, geen versmelting, maar een antwoord en bevat dus ook tegenspraak en dissonantie. C’est un texte très intéressant et surtout très clair. Sans être trop dispersif, ce livre explique très bien la contemporanéité en expliquant le concept d’accélération. En effet, Rosa montre comment le monde d’aujourd’hui est conditionné par un rapport avec le temps de plus en plus conflictuel, parce que la vitesse est devenue un impératif. La technologie a permis à l’homme de gagner du temps, parce qu’elle a rendu de nombreuses activités beaucoup plus faciles et rapides. Mais elle a aussi oblig C’est un texte très intéressant et surtout très clair. Sans être trop dispersif, ce livre explique très bien la contemporanéité en expliquant le concept d’accélération. En effet, Rosa montre comment le monde d’aujourd’hui est conditionné par un rapport avec le temps de plus en plus conflictuel, parce que la vitesse est devenue un impératif. La technologie a permis à l’homme de gagner du temps, parce qu’elle a rendu de nombreuses activités beaucoup plus faciles et rapides. Mais elle a aussi obligé tout le monde à être continûment connecté, à être toujours disponible. C’est pourquoi plus de vitesse a signifié plus d’occupations et donc plus de stress. Les changements sociaux affectent la vie des personnes qui sont obligées de reformer leurs projets plusieurs fois. Paradoxalement, la vitesse a contribué à diffuser des situations de décélération, causées par un excès de vitesse (par exemple : le trafic) ou pour des questions idéologiques. De plus, l’accélération en tant qu’impératif a rendu les personnes moins libres, donc elles ont commencé à avoir des comportements d’inertie, où il n’y a plus de sens critique. La politique, enfin, a perdu son rôle de progression sociale : en effet, les changements du monde économique sont plus rapides que ceux de la loi. Ce dernier mot est même devenu synonyme de contrainte, celle qui va contre la vitesse du marché. La vitesse a produit des nouvelles formes d’aliénation. Par exemple, il n’y a plus de rapport entre les objets de notre vie, ils ne font plus partie de notre identité parce qu’ils sont remplacés trop rapidement. De plus, il n’y a plus de rapport strict avec nos actions : on fait beaucoup de choses très rapidement, sans réfléchir, pour respecter quelque obligation du travail. Quelques fois, à cause des contraintes, on fait des choses contraires à ce qu’on veut réellement faire. Aujourd’hui nous vivons donc dans un rapport tragique avec notre propre vie parce qu’il n’y a plus de lien entre notre volonté et nos agissements. Eine kritische Betrachtung der Entwicklung der "Spätmoderne". Alles wird immer schneller. Dadurch, dass alles immer schneller wird, läuft man Gefahr, den Bezug zu Raum, zu Zeit, zu den Dingen, zum sozialen Konnex und zu sich selbst zu verlieren. Kaufen wird wichtiger als Konsumieren. Als Leistungsträger gilt, wer das Tempo halten kann - die anderen sind die Beschleunigungsverlierer. Regt zum Denken darüber an, was wirklich wichtig ist im Leben, weshalb Erfahrungen mehr zählen sollten als Erlebnis Eine kritische Betrachtung der Entwicklung der "Spätmoderne". Alles wird immer schneller. Dadurch, dass alles immer schneller wird, läuft man Gefahr, den Bezug zu Raum, zu Zeit, zu den Dingen, zum sozialen Konnex und zu sich selbst zu verlieren. Kaufen wird wichtiger als Konsumieren. Als Leistungsträger gilt, wer das Tempo halten kann - die anderen sind die Beschleunigungsverlierer. An important and disturbing book about the inescapability of accelleration in today's society. A very convincing framework to make sense of the nature of change in the twenty-first century. Personally I found this book very enlightening because even though I'm young I always questioned the concept of time and why it seems to pass faster and why we always feel as if we do nothing. It requires a bit of attention because of its theoretical vocabulary and language, however once you start understanding the idea, you become more and more interested in the subject and keep reading so it doesn't take long. A great book about an interesting subject. There are some interesting ideas in this book, and I believe reflections on the relationships of societies with time are indeed needed. I just wish this book was more rigorous and better documented. For instance I didn't find anything like an inventory of the experiences that are / have been accelerated, much less the technical paths that led to such accelerations. Generally, acceleration is drawn as a monolithic phenomenon coming out of nowhere. A lot of the examples are awkwardly (for a social There are some interesting ideas in this book, and I believe reflections on the relationships of societies with time are indeed needed. I just wish this book was more rigorous and better documented. For instance I didn't find anything like an inventory of the experiences that are / have been accelerated, much less the technical paths that led to such accelerations. Generally, acceleration is drawn as a monolithic phenomenon coming out of nowhere. A lot of the examples are awkwardly (for a social researcher) taken directly from the author's experience.